For transcoronary progenitor cells’ administration, injections under flow arrest (over-the-wire balloon technique, OTW) are used universally despite lack of evidence for being required for cell delivery or being effective in stimulating myocardial engraftment. Flow-mediated endothelial rolling is mandatory for subsequent cell adhesion and extravasation. To optimize cell directing toward the coronary endothelium under maintained flow, the authors developed a cell-delivery side-holed perfusion catheter (PC). Thirty-four patients (36-69 years, 30 men) with primary stent-assisted angioplasty-treated anterior MI (peak TnI 151 [53-356]ng/dL, mean[range]) were randomly assigned to OTW or PC autologous 99Tc-extametazime-labeled bone marrow CD34+ cells (4.34 [0.92-7.54] × 106) administration at 6-14 days after pPCI (LVEF 37.1 [24-44]%). Myocardial perfusion (99mTc-MIBI) and labeled cells’ activity were evaluated (SPECT) at, respectively, 36-48 h prior to and 60 min after delivery. In contrast to OTW coronary occlusions, no intolerance or ventricular arrhythmia occurred with PC cells’ administration (P < .001). One hour after delivery, 4.86 [1.7-7.6]% and 5.05 [2.2-9.9]% activity was detected in the myocardium (OTW and PC, respectively, P = .84). Labeled cell activity was clearly limited to the (viable) peri-infarct zone in 88% patients, indicating that the infarct core zone may be largely inaccessible to transcoronary-administered cells. Irrespective of the transcoronary delivery method, only ≈5% of native (i.e., non-engineered) CD34+ cells spontaneously home to the injured myocardium, and cell retention occurs preferentially in the viable peri-infarct zone. Although the efficacy of cell delivery is not increased with the perfusion method, by avoiding provoking ischemic episodes PC offers a rational alternative to the OTW delivery. Parts of this work have been presented to the Transcatheter Cardiovascular Therapeutics (Novel Concepts and Innovative Devices—Invited Faculty Session) and to the European Society of Cardiology (Young Investigator Awards). Supported by Ministry of Science and Higher Education (Poland) (project PBZ-KBN-099/P05/2003) and ‘For the Heart Foundation’ in Kraków, Poland. AZ was a recipient of the City of Krakow Research Scholarship. Evidence indicates that, similar to leukocytes, flow-mediated undisturbed “physiological” rolling in contact with endothelium is a primary, mandatory step in progenitor cells trafficking.5 Progenitor cells endothelial rolling (mediated largely by selectins) is a “primer” for integrin-mediated downstream adhesion to the activated endothelium, and chemokine-mediated transendothelial diapedesis (extravasation) and migration to the injured tissue.4,5 In addition, blood flow-related hydrodynamic forces are known to play an important role in the cell rolling and adhesion process by interacting, for instance, with the selecin bonds.14 This suggested that cell administration under maintained coronary flow might be more effective than the coronary-occlusive delivery. The perfusion technique, including the employment of side-holed catheters, has been in clinical use since 1990s for transcoronary drug administration under maintained coronary flow.15,16 More recently, the perfusion technique was found effective in transcoronary gene delivery in the pig heart in situ.17 Initially, in a pilot study the authors tested the feasibility of autologous bone marrow cell delivery through a perfusion catheter intended for intracoronary drug administration.4 Currently, the authors have developed a side-holed perfusion catheter (PC) dedicated to cell delivery under maintained coronary flow and, in a randomized study in man, the authors have quantified early myocardial uptake of autologous CD34+ cells administered with the stop-flow versus perfusion technique. The side-hole design of the perfusion catheter was chosen because this design was previously shown to be optimal for towards-the-wall delivery.15,16 For bench testing, the authors designed PCs with the following parameters: (1) lumen size of 0.9 or 1.2 mm; (2) side-hole number of 8, 10, 12, 15, or 20; and (3) side-hole diameter of 0.10, 0.15, or 0.20 mm. All PCs were designed in rapid exchange (RX) system, with two independent lumens (one, RX, for a 0.014 inch guide-wire, and the other for cell-suspension injection). For each catheter, in a system mimicking a coronary artery, the authors evaluated the delivery pressure required to achieve optimal out-flow from a maximal number of side-holes (cell-suspension solution). Catheters with lumen size of 0.9 mm yielded no outflow of the cell-suspension solution for the hole size of 0.10 mm and, for hole sizes of 0.15 or 0.20 mm, only poor outflow which, however, required delivery pressures of at least 10-15 barr (N.B. manual inflation pressure is 3-4 barr). Catheters with side-hole numbers of 10, 12, 15, or 20 and/or side-hole sizes of 0.20 or 0.25 mm required very high inflation pressures (10-20 barr) to overcome drop-like outflow of the cell-suspension solution and thus they were rejected to avoid baro-trauma to the cells. The PC with lumen size of 1.2 mm and 8 side holes of 0.15 mm each yielded optimal out-flow from all side holes at 3 barr; thus, this design was selected for our clinical study. An order was placed, according to our specifications, with a producer of catheterization equipment (Balton Ltd, Poland). In contrast to the over-the-wire (OTW) balloon catheter, the PC did not require guidewire pull-back for cell delivery; thus it could offer guidewire security of the artery during administration of progenitor cells. Our working hypothesis was that “physiological” delivery of autologous CD34+ cells through the perfusion technique (PC) might be associated with a greater early myocardial retention than the conventional OTW (under flow arrest) cells administration. 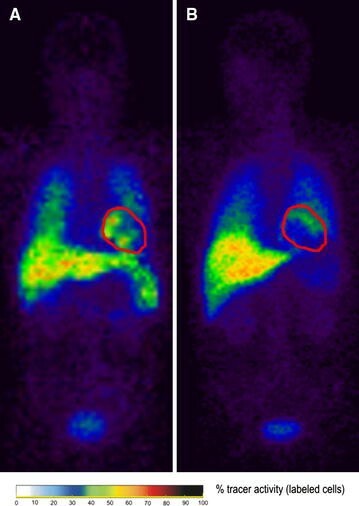 The study was carried out in humans because the perfusion technique is not new to clinical use,15,16 and animal studies are unlikely to precisely determine the effectiveness of cell delivery in patients.18 Nuclear-tracer cell labeling was employed as the current method of choice for high-sensitivity in vivo imaging of the transplanted cells in man.19-21 Radionuclide labeling (the nuclear tracer and/or its carrier), however, can be harmful to the therapeutic cells leading to the impairment of their functional (and thus potential therapeutic) capacity.19,20 Also, administration of nuclear-tracer labeled cells is associated with an additional radiation burden to the patient.19,20 For these reasons, and consistent with the size of published hypothesis-testing randomized stem-cell studies in man,22 the Institutional Review Board approved a study in a maximum of 36 patients (2:1 randomization, see below) and required mandatory data analysis prior to any potential submission for study extension. The study conformed with the Declaration of Helsinki. It included unselected, consented (informed written consent) patients with primary angioplasty (pPCI)-treated first myocardial infarction (anterior location; infarct related artery (IRA) = left anterior descending coronary artery) and a definite infarct-related myocardial injury manifest as peak troponin I > 50 ng/mL and left ventricular ejection fraction (LVEF) <45% when screened by echocardiography at 4-8 days after pPCI. On the morning of the day of cell transfer (6-14 days after pPCI), bone marrow (80-120 mL) was harvested from the iliac crest.3,7 Mononuclear cells were separated with Ficoll™,3,7 and CD34+ cells were immunomagnetically selected with mononuclear antibodies coupled to magnetic beds (MidiMACS System, Miltenyi Biotec GmbH).3 The average number of mononuclear cells was 3.46 × 108 (range 0.91 × 108-5.48 × 108), and CD34+ cell yield was 4.34 × 106 (range 0.92 × 106-7.54 × 106). After transfer to a nuclear medicine lab, the cells were labeled with 99mTc-extametazime (Ceretec, Amersham) according to a previous protocol.24 In brief, for each subject all the harvested cells were incubated for 30 min (37°C) with 99mTc-extametazime (110 MBq);24 a lipophilic compound that turns hydrophilic after crossing the cell membrane and remains intracellular during cell tracking.20 Then the cells were washed thrice and re-suspended in 10 mL heparinized (10 IU/mL) saline.24 For cell labeling, the authors used 99mTc-extametazime and not 111In-oxine because the latter was shown to have a substantial detrimental effect on the integrity, viability, migration and proliferation of hematopoetic progenitor cells,25,26 while 99mTc-extametazime is considered significantly less toxic.27,28 Radioactivity of the labeled cells was determined with a rate meter (PTW-Curiementor 2). Cell viability was assessed with trypan blue dye exclusion assay4,29 prior to and after labeling. The number of dead cells (not excluding the dye—thus stained blue) was examined under microscope per 500 cells and expressed as percentage. To determine the zone(s) of myocardial uptake of CD34+ cells, SPECT images of 99mTc-labeled cells’ activity were integrated with the corresponding SPECT images of myocardial perfusion (3D-CardioFusion algorithm, CardioFusion application on Leonardo workstation VE30A/VE30B, SYNGO MMWP, Siemens; regions of interest defined by common reference points according to software manual). Variables are presented as mean ± SEM (range). For between-group comparisons Mann-Whitney test for independent samples was used. Correlations were evaluated with Spearman’s coefficient. For within-group comparisons ANOVA was used. Statistical significance was at P < .05. Thirty-four patients (30 men) aged 36-69 years were recruited. The OTW- and PC-group were similar with respect to demographic, clinical, and laboratory characteristics (Table 1). The CD34+ cell number, and the labeled cells’ viability and activity were also similar (Table 2). Labeling efficiency, defined as the fraction of label retained by the cells, was 65.4 ± 2.1% (43.7-77.8%) and was not different between the study groups (64.6 ± 3.2% vs 66.1 ± 2.6%). The number of CD34+ cells correlated with their activity (r = 0.74, P < .05, not shown) and the labeling procedure had a small but significant effect on the cell viability (Table 2). Following labeling, the 99mTc radiation burden per cell (cells total activity/cell number) was 23 ± 3 Bq. * n = 4 non-gated (arrhythmia). † n = 1 non-gated. # n = 3 non-gated. * P < .05 for cell viability before versus after labeling. # One hour after trans-coronary cell delivery; fraction of total body activity on a whole-body γ-scan. In the majority of OTW patients (n = 10/13; 77%) the cell infusion time (i.e., the duration of in-stent occlusions of the LAD) was limited by occlusion intolerance manifesting as increasing chest pain and/or progressive ST-segment displacement. In addition, there was one event of the IRA occlusion-triggered ventricular tachycardia (this occurred in our third OTW patient, at 47th second of the second balloon inflation to inject the cells and was preceded by increasing ST elevation, Figure 1). Since others34 have reported a similar observation (malignant arrhythmias provocation by the IRA OTW-balloon occlusions to deliver the progenitor cells), the authors have not extended the balloon inflation time over the point of increasing intolerance (average occlusion time was 69 s, 82 s, and 89 s for the 1st, 2nd, and 3rd occlusion, respectively). In contrast to the OTW group, in the 21 PC-patients there were no signs of symptoms of cell-delivery intolerance (10/13 vs. 0/21, P < .001). One hour after transcoronary cell delivery, the percent myocardial activity (an index of early myocardial retention of cells)14,17,18 was 4.86 ± 0.49 (mean ± SEM, 95% CI 3.32-6.58, range 1.7-7.6) in the OTW group and 5.05 ± 0.48 (95% CI 3.58-6.27, range 2.2-9.9) in the PC group (P = .84). This indicated that the coronary non-occlusive cell delivery did not lead to a higher early myocardial retention of autologous CD34+ cells (Figures 2, 3). Tracer uptake in the liver, lungs, spleen, bowel, and urinary bladder was also similar and not statistically different in the OTW- versus PC-group (Table 2). Qualitative evaluation of the cells’ myocardial uptake zone (by integrating SPECT images of myocardial perfusion and SPECT images of the cells’ uptake) revealed two distinct patterns that were independent of the method of cell delivery (Figure 4I, II). In 88% patients (n = 30/34) the early engraftment was clearly limited to the peri-infarct zone, with no detectable activity in the zones of normal perfusion or in the no-perfusion (central infarct) zone. A small proportion of patients (12%, n = 4/34) displayed a diffuse infarct injury zone radioactivity uptake (examples in Figure 2II); this occurred only if myocardial perfusion was present throughout the infarct injury zone (Figure 4II, A1-A3). The diffuse pattern of engraftment occurred in subjects with the smallest MIs (peak troponin, and CK-MB in the 1st quartile; LVEF in the 4th quartile; the values of 55.7 ng/mL, 376 U/L, and 42.6% in contrast to those in patients with the peri-infarct engraftment pattern where the respective mean values were 163.7 ng/mL, 620 U/L and 32.1%, P < .05 for all). This study is the first human study on visualization and quantification of early retention of CD34+ cells delivered transcoronary with a non-occlusive technique. Our principle findings are as follows. First, in contrast to OTW coronary-occluding technique, no intolerance or ventricular arrhythmia occur in patients with a recent MI with cell administration through side-holed perfusion catheter dedicated to cell delivery. Secondly, irrespective of the transcoronary delivery method, early myocardial uptake of 99mTc activity is in the order of ≈5% (range from ≈2% to ≈10%), consistent with the idea that only a small fraction of native (non-engineered) CD34+ cells spontaneously homes to the injured myocardium. 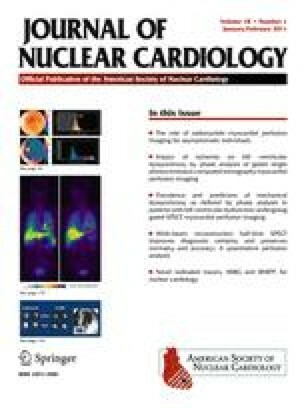 Moreover, in the vast majority of patients early myocardial retention of radioactivity is limited to the (viable) peri-infarct zone, indicating that the infarct core zone is not directly accessible to the transcoronary-administered cells. For transcoronary cell delivery, clinical studies have universally1-3,7,8 adopted the stop-flow technique that is based on the use of the central lumen of a coronary-occluding OTW balloon catheter positioned in the stent. To deliver the cells, the OTW balloon is inflated leading to a flow arrest in the epicardial artery, the guidewire is then removed and the cell suspension is injected.7 An effective flow arrest on balloon inflation35 precludes physiological flow-mediated endothelial rolling of the cells in the epicardial artery during cells injection. Then, on balloon deflation there is an instantaneous reactive increase in the epicardial and capillary flow velocity (with normal values exceeded by ≥2-fold35). Flow-related hydrodynamic forces affect selecin bonds that physiologically form between the administered cells and the endothelium.11 Moreover, the “waterfall” effect35 of reactive hyperemia can contribute to a rapid, undesired cell wash-out, thereby limiting the proportion of cells that can effectively interact with the activated endothelium situated downstream (i.e., in the injury zone) and trans-migrate into the injury zone. In the pig model of myocardial infarction, dynamic scintigraphy of [18F]-fluorodezoxyglucose (FDG)-labeled progenitor cells recently confirmed a rapid loss of ca. 80% cells on OTW balloon deflation,21 whereas in humans repeated balloon occlusions of the infarct artery for cell delivery were reported to stimulate adverse regional no-flow in the infracted myocardial tissue.36 In addition, OTW-cell delivery can be associated with the triggering of malignant ventricular arrhythmias4,34 (Figure 1). This effect is not unexpected, since the forming myocardial scar is an arrhythmic substrate and ischemia is a well-known arrhythmic trigger. Since prior study protocols included the OTW-balloon IRA occlusions for periods ranging from 3 min1-3,7 to 9 ± 6 min,8 the pro-arrhythmic effect of IRA occlusions for cell delivery is likely to have been under-reported. We hypothesized that a non-occlusive, endothelium-targeting cells’ delivery through a side-holed PC might enhance physiological homing (1) by enabling undisturbed physiological rolling in contact with the endothelium of a greater proportion of infused CD34+ cells (increase in an effective contact probability), and (2) by avoiding the accelerated cell wash-out on balloon deflation. Why would a “physiological” delivery not translate into an increased early engraftment of CD34+ cells? First, the side-holed PC may have failed in the intended delivery of a significant proportion of the cells to the epicardial artery endothelium. Individual cell rolling in contact with the endothelium has been recently visualized (demonstrated qualitatively),38 but no current imaging technique can quantify this effect (i.e., determine the proportion of cells rolling in contact with endothelium after the PC vs OTW delivery to the epicardial artery). Thus, a later step in the “fate” of the cells was quantified, i.e., the magnitude of early engraftment inferred from percent activity uptake in the myocardium (Figure 3). Secondly, the absence of flow-mediated endothelial rolling during balloon occlusion (IRA flow ceased) and the enhanced rapid cell washout on balloon deflation could both be compensated by a temporary ischemia-induced stimulation of cell-adhesion mechanisms in the injury (border-) zone that may occur with repeated IRA balloon inflations. It has been shown, for instance, that the endothelial expression of P-selectin on cardiac microvessels can be rapidly up-regulated (via transport to the endothelial cell surface) by brief episodes of ischemia.39,40 Recent work in the pig, however, suggested a possible ≈30% reduction in delivery efficiency for cell injection with an inflated vs. non-inflated OTW balloon catheter (111Indium cell labeling; myocardial retention at one hour of 6.1% ± 2.5% vs 4.1% ± 1%),41 whereas in this study PC-injections were not less effective than trans-OTW cells’ administration (Figure 3). Evidence shows that flow-mediated endothelial rolling is mandatory for subsequent cell adhesion and extravasation in the zone of activated endothelium.5 Even if the side-holed PC method was indeed successful in directing the cells towards the endothelium, it might have no significant impact on the microcirculatory flow (and thus cell uptake) because the “distance” of rolling necessary for optimal down-stream adhesion is undetermined.5,38 A third (and not unlikely) possibility is that the pool of native (non-engineered) CD34+ cells used in clinical studies to-date may contain only a fraction of cells that are “naturally” capable of colonizing the myocardial infarct injury zone (i.e., possess a desirable pattern of receptors and appropriate functional capacity). This concept is exemplified, for instance, by the presence of the CXCR4 receptor in less than 50% of CD34+ cells.3 Although CXCR4 is mandatory, it is not sufficient for homing to the injury zone.42 This indicates that other (yet unidentified) receptors are needed for CD34+ homing to the injured myocardium, and only a fraction of CD34+ cells may spontaneously express the “full” (desired) pattern. It is not unexpected that selective transcoronary approach is ineffective for cell delivery to the non-perfused myocardium because lack of tissue perfusion in the infarcted area would prohibit direct uptake of transcoronary-delivered cells in the infarct central zone (Figure 4I). However, progenitor cells (including bone marrow-derived tissue-committed stem cells)5,42,43 are known to migrate in the gradient of hypoxia-induced chemokines such as SDF-1.42,43 Recently, the gradient of SDF-1 has been shown to increase 4-fold from the border to the center of the infarct area,44 indicating that endogenous mechanisms can stimulate cell migration from the infarct border-zone towards the center of the forming scar. Potential determination of the magnitude of this effect, however, was beyond the scope of this study which was focused on short-term cell tracking (99mTc half-life is 6.03 h, fraction remaining is 50.2% at 6 h and 6.3% at 24 h). Peri-infarct (rather then infarct central-zone) engraftment might contribute to the apparent ineffectiveness of transcoronary-delivered cells in patients with very large myocardial infarctions,8 indicating that other delivery strategies22,36 need to be considered if cell therapy was aimed at large zones of “irreversible” injury. Due to its relatively low spatial resolution (≈8 mm) SPECT does not allow to evaluate the transmural extent of the infarct.45 Therefore, the apparent diffuse pattern of early cells’ engraftment (Figure 4II) that was detected in a small proportion of patients (12%) may simply reflect a modest myocardial injury, consistent with the relatively small necrotic enzyme release in this patient group. Maintained myocardial perfusion in the infarct injury zone (prior to cell transfer) in subjects with relatively small MIs (Figure 4II) could explain the “negative” outcome of cell therapy in clinical studies including patients with small MIs (c.f., e.g., the group with LVEF >49% in REPAIR-AMI7) who are a priori (i.e., without cellular therapy) likely to experience only a mild residual damage. This study shows that, in humans, altering the transcoronary delivery technique is unlikely to increase the “poor” myocardial retention of native (non-engineered) CD34+ cells delivered 6-14 days after pPCI (Figure 3). Could the delivery efficiency be increased by changing the timing of cell transplantation? This is unlikely for the reasons as follows. First, the timing of cell injections in our study was consistent with the peak of spontaneous release of CD34+ cells from the bone marrow after MI,46,47 while data in animal models indicate that the mechanisms attracting the cells to the ischemic myocardium do not peak immediately after AMI.44 Second, clinical studies with cells delivery within the first 24 h of AMI have clearly demonstrated no effect of cells injections1,2 whereas functional data from REPAIR-AMI (no treatment effect for cell transfer at ≤4 days, the largest effect at 6-14 days)7 are consistent with the idea that cell administration should match the peak of their spontaneous release from the bone marrow. Indeed, recent study11 on the relationship between the time of progenitor cells administration and their recruitment to the infracted human myocardium (peak engraftment at 5-14 days; followed by a reduction in engraftment proportional to the time after AMI) indicate that timing of cell delivery in our study matched the optimal potential for myocardial engraftment. Direct needle injections (transepicardial or transendocardial)22,36,51,52 may lead to heightened, at least initially, local cells retention but these are neither physiological (for instance, the highly hypoxic milieu in the center of the forming scar may reduce cell viability51) nor widely applicable in the clinical setting. Other strategies to improve cell homing to the injured myocardial tissue include pre-treatment of the cells (to activate their incorporation in the damaged tissue) or pre-treatment of the target tissue (to augment chemoattractant factors).5,49 Experimental work has identified several mechanisms of progenitor cell homing to the infarct injury zone, involving molecules such as HGF, VEGF, ICAM-1, HMGB-1, and the SDF-1-CXCR4 axis.5,42,43,53 Ex vivo activation of adhesion molecules on the cell surface or over-expression of chemokine receptors (such as CXCR4), the use of bispheric antibodies recognizing myosin light chain, or intramyocardial SDF-1 delivery have all been found promising in animal models.5,6,49 However, in mammals, healing after acute ischemic events is naturally biased towards scar formation and not regeneration of functional tissue49; a constraint that remains to be overcome by cell-based therapeutic strategies. While evaluation of distinct transcoronary delivery strategies is clearly beyond the scope of small animal models of MI,57 it is unlikely that performing our study in a large animal could lead to more insights with regard to the efficiency of the distinct transcoronary cell delivery techniques that we tested. We did initially consider a preliminary study in the pig model of MI but we took the decision against it for the following reasons: (1) the PC technique is not novel to interventional cardiology15,16 and a pilot study in man already showed that this technique is safe and feasible for transcoronary cell delivery,4 (2) for the two delivery methods tested, no current imaging technique could quantify the proportion of cells rolling in contact with endothelium or proportion actually extravasating in the injury zone (thus, with this respect, no animal model would be more informative than the human data), (3) preclinical studies are unlikely to predict the effectiveness of cell delivery techniques in patients.18 Moreover, the coronary-occlusive (OTW) technique has already been used universally in the clinical setting (over 1,500 patients in clinical studies)1-3 without any evidence for being required or effective in stimulating engraftment.6 This necessitated testing the effectiveness of distinct transcoronary delivery techniques directly in man,6,11-13,18 as a prerequisite to looking for any potential therapeutic effect.5 The use of histological techniques or other techniques limited to animal models (such as reported gene assays) to evaluate longer-term engraftment19,20,32 would have had a further role in the context of our study hypothesis if the “basic” 99mTc-labeled cell data SPECT had showed any signal of a difference between the two delivery methods that we tested. The use of a whole-body single-planar scan with a manual LV delineation could be associated with over-estimation of myocardial engraftment due to inclusion of tracer uptake by, for example, part of the lung. An animal study could offer a direct quantification of the labeled cells activity in explanted organs rather than the indirect evaluation from a whole-body (planar) scan. Such study, however, had already been performed, and heart-harvesting studies of radiolabeled cells homing in the pig33 have been consistent with whole-body cells’ imaging in the pig41 and in man.28,37 In addition, a recent study on homing of 111In-labeled mesenchymal stem cells in the pig58 reported an excellent correlation (r = 0.929) between ex vivo γ-activity of the isolated heart and other organs (lungs, kidneys, spleen, urinary bladder) and the organ activity detected on a whole-body scan. This study, performed in patients with recent MI, fills a long-standing gap in the essential need to evaluate whether different transcoronary delivery strategies could be useful for improving the poor myocardial engraftment of (non-engineered) progenitor cells in humans.6,11-13 We found that the effectiveness of the perfusion technique (side-holed perfusion catheter, cells injections under maintained coronary flow) is not different from that seen with the OTW-balloon method. This indicates that the repeated coronary occlusions (thus far adopted universally1-3) are not required for transcoronary administration of cellular therapies. In addition to providing a guidewire security of the infarct-related artery during cells administration, cell administration under maintained coronary flow does not provoke transient ischemic episodes which are seen with the stop-flow (OTW) delivery and can affect the safety of OTW cell delivery by triggering malignant arrhythmias. For these reasons the perfusion technique provides a viable alternative to the conventional coronary-occlusive delivery of cellular therapies. Moreover, our demonstration that retention of progenitor cells occurs preferentially in the (viable) peri-infarct zone is consistent with the idea that the infarct core zone may be largely inaccessible to transcoronary-administered cells. These findings may have implications for the interpretation of current—and design of further—clinical studies involving transcoronary delivery of cellular therapies. We thank Professor M.Z. Ratajczak of the Institute of Regenerative Medicine, Stem Cell Biology Program, University of Louisville, KY, USA for his tutorials on the biology of progenitor cell trafficking and for his contribution to the study concept. We thank Professors M. Tendera and W. Wojakowski of Medical University of Silesia, Katowice, Poland for their support to the study set-up and execution. The authors indicated that they have no financial conflicts of interest. Van der Spoel TIG, Vrijsen KR, Sluijter JPG, Nijsen F, Van Het Schip AD, Vouken EPA, et al. Insights on cell delivery efficiency in a porcine model. European Society of Cardiology 2010 Abstract Book-P2430. http://spo.escardio.org/abstract-book.